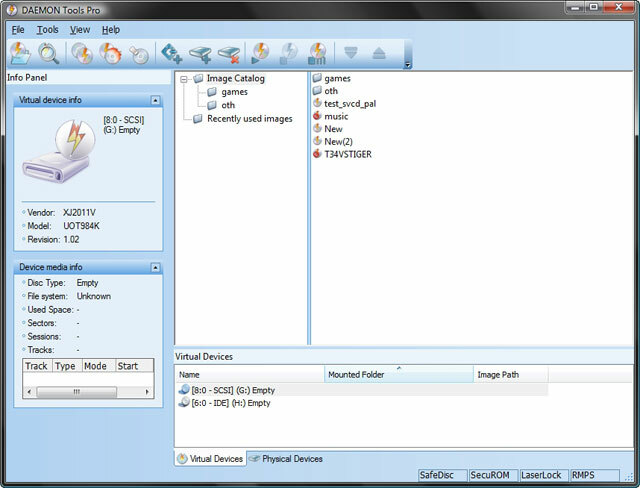 DAEMON Tools converts your computer CD/DVD discs into "virtual discs" or so called "disc image" files, which run directly on your hard drive. This protects original CD/DVD discs from loss, theft, and damage, plus a virtual disc has much better access rates than a physical CD/DVD disc in a physical CD/DVD ROM drive because the reading speed of a virtual CD/DVD-ROM is dozen times faster compared to normal CD/DVD drive. Still probably the best tool of its kind. Unfortunately it contains non-optional spyware which some A/Vs identify as containing a trojan (it installs secondary backdoor programs). Sadly, the authors of Daemon Tools have become increasingly shady over the past couple years. Considering there are now viable free alternatives I'm forced to suggest staying away from Daemon Tools. Catalan language added to the list of supported languages. This once was king. But the king has fallen. Author needs to get a clue. Virtual clone drive is free and has no bullsh1t malware included. -Too much junk included, even if its optional, its still junk. UltraIso does that job and much more. 2 Star because it works and its free. One of the best program for mounting images. Its always worked well for me when mounting movie images. I did have a mystery phantom drive appearing that couldn't be un-installed until I restarted my computer. The program hasn't happened again, but it could be a problem with the virtual driver. Anyway Thanks. -2 for all the bundled junk software. +1 for making SPTD rootkit optional. Years ago I used to use this software. But PowerISO is smaller, installs more reliably, and is better in just about every way except eye candy. -1 for constantly phoning home. -1 for rootkit like SPTD drivers. Otherwise a solid piece of software. What a crap. I got the infamous "Internal setup error . error code : 14". This error is known since 2007 and these dumb guys are unable to fix it during the last 3 years. All they mumble is to uninstall your security software, hack your registry and do some other voodoo. GO TO HELL you stupid incompetent idiots! Now I am very satisfied with UltraISO and VirtualCloneDrive. - Har, Har, April 1st!